The Sustainable Harvesting Programme interacts with a number of institutions within and beyond our borders to motivate ongoing research that is relevant, improves the wild cut flower industry and conserves our fynbos heritage. We also have an active research working group who help evaluate the value and validity of research conducted through the programme. Impacts of harvesting on fynbos ecology and landscape management. A high road to sustainability? Wildflower harvesting, ethical trade and social upgrading in South Africa’s Western Cape. Journal of Agrarian Change. 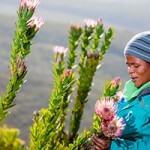 Flower Harvesting on the Agulhas Plain, South Africa: Challenges in a fragmented industry. South African Journal of Science. Postcolonial perspectives on global production networks: insights from Flower Valley in South Africa. Environment and Planning. Wild flower harvesting on the Agulhas Plain, South Africa: Impact of harvesting intensity under a simulated commercial harvesting regime for two re-seeding and two re-sprouting Fynbos species. South African Journal of Botany. Wild flower harvesting on South Africa’s Agulhas Plain: a mechanism for achieving sustainable local economic development? Sustainable Development. Futures, ethics and the politics of expectation in biodiversity conservation: A case study of South African sustainable wildflower harvesting. Geoforum. Ethical production in South Africa: Sustainable Wildflower Harvesting and Fairtrade Raisin Production. Carbon stocks in fynbos, pastures and vineyards on the Agulhas Plain, South Africa: a preliminary assessment. Farmers’ views of landscape initiatives: The case of the Agulhas Plain, CFR. Analysis of prevailing prices and costs in the industry (Afrikaans). Farmer’s attitudes to conservation in the Strandveld (Afrikaans). The effect of ploughing and natural augmenting. Resource Base Assessment for Wild Fynbos Harvesting: a Critical Review. Honours Thesis. Stellenbosch University. 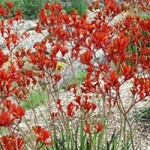 Wildflower farming on the Agulhas Plain- Fynbos management and conservation. Masters Thesis. Stellenbosch University.